This is the last of the cards I have made using the Graphic 45 Come Away With Me papers. 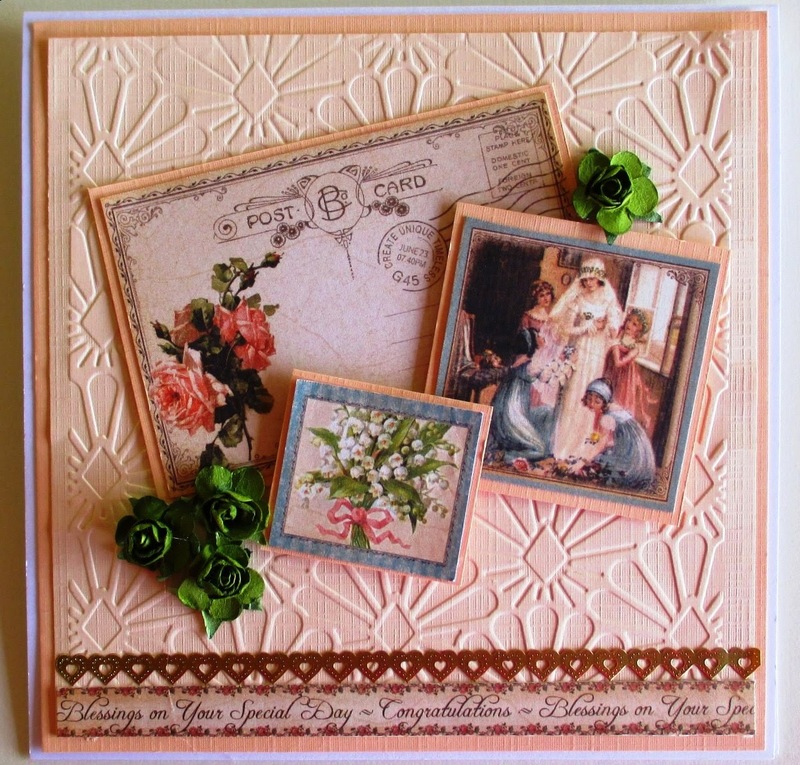 Continuing on with the cards I have made using the Graphic 45 Come Away With Me papers. I think this card would be suitable to give to a man. I have used a square card layered with G45 papers and tags and stickers from the sheets included in the range. Thank you for visiting my blog this week Have a great weekend. I have used 6inch square card and added a die cut bird and a Hearty Crafts 3d Rose from Blue Edge Crafts . I finished with a greeting from The Sticker Store. Something a little different to day I made this decorated Ostrich egg as a wedding gift for my daughter. 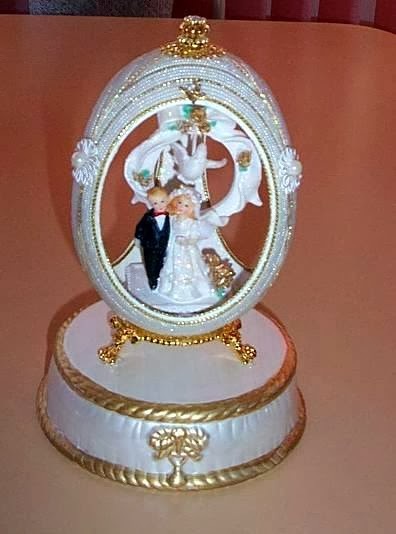 The outside of the egg is encrusted in beads and the stand is hand painted . I coloured the map using Tim Holtz inks, added the "road" around the edge of the map and used sticker from the Sticker Store to depict different areas of Australia, the beaches, the outback, the wine region etc Just a bit of fun. Thank you for visiting my blog this week . Enjoy your weekend. A wedding card today using Graphic 45 Sweet Sensations papers, and embossed background and sticker edging. I finished the card with paper roses and a few touches of Kindy Glitz. A little bit of Christmas in May:) I have used a 6x6 card layers with red card, Graphic 45 12 days of Christmas papers, paper doily, flowers and butterfly. I made this tag as a little extra for my partner this month. A very simple tag but I do love this embellishment. Thank you for visiting my blog this week I hope you have enjoyed my creations. ﻿ The theme for our monthly swap at Craft Mad was to make two cards with Frames . I chose to make a square card with deep lilac card overlay and Spellbinders Captivating Squares alternated in white and Deep Lilac I finished the card with sticker corners, rhinestones and a greeting. For my second card I chose a 6 x 6 square card layered with linen card and then an embossed layer I added a Scrapmatts heart frame and a Hearty Crafts 3d Die and a Cheery Lyn butterfly. 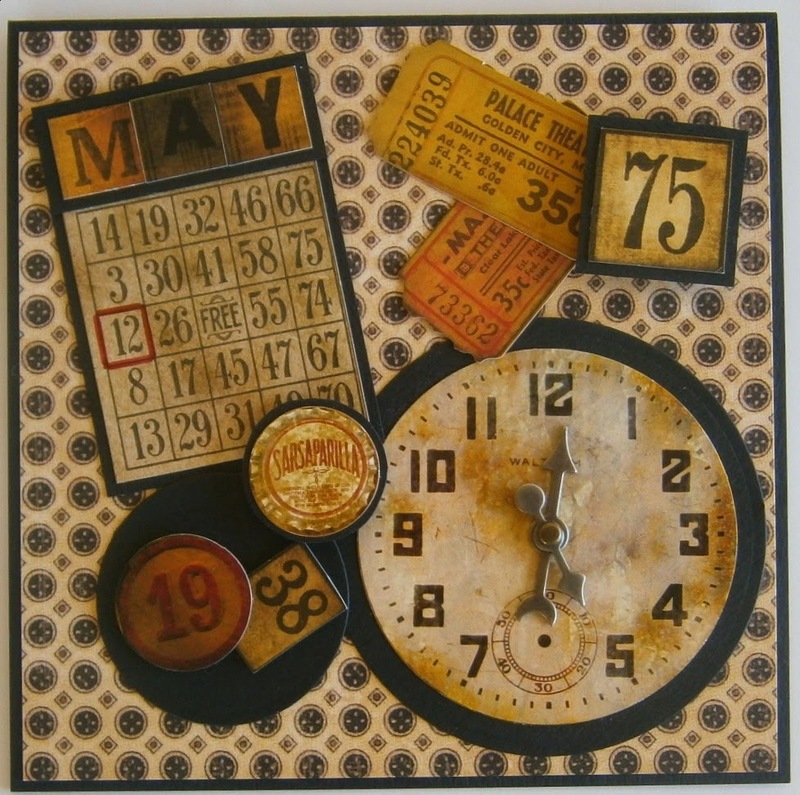 I made this card for Ron"s birthday last year and used the embellishments to show his birthdate, year, time and age I have used a square card layered with black linen card and Graphic 45 paper and added Tim Holtz embellishments to make a card suitable for a man's birthday.